A poster on the event. The venue was a large, exterior stage, built to the precise specifications of Manick Sorcar Productions. An estimated 4500 people witnessed the show. “Swamiji” came, saw, and conquered the hearts of the people of this great and historically famous city. The much celebrated Manick Sorcar classic documentary on Swami Vivekananda was shown at Vastrapur Lake Ampithetre, Ahmedabad, amidst a record gathering of about 4500 people who witnessed the unforgettable event in front of their eyes. 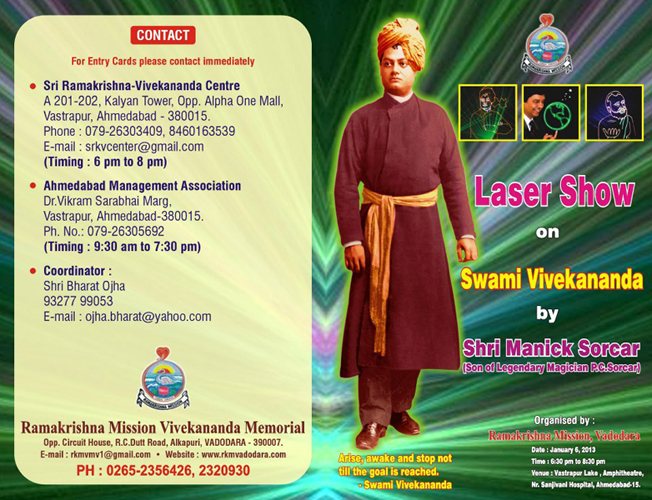 Swami Nickileswarananda, Secretary of Ramakrishna Mission Vivekananda Memorial, said, “in order to meet the demand of the popular show we showed it twice on January 2, at Vadodara. It was also shown at Rajkot. Today is the last show by Manick Sorcar in Gujarat. We selected this large amphitheatre so that a great number of people can witness it together ”. Local newspapers gave rave reviews of the show with colourful pictures from the documentary. People hung around after the show to convey their thanks to Manick Sorcar and his group for bringing the show to Ahmedabad. 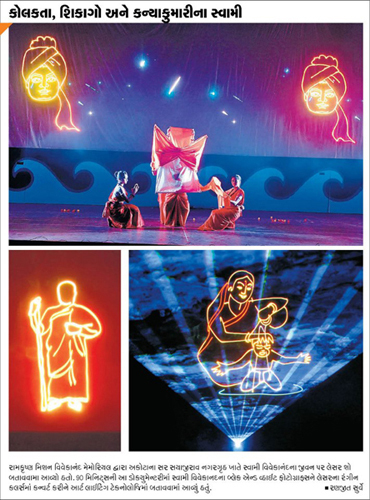 News coverage with color pictures of the show by Divya Bhaskar, the popular newspaper of Gujarat. Julie Golberg: I think you should bring it to the U.S.
Satish LM: Hi Sir, on jan 6 we thoroughly enjoyed the show. The show is truly innovative.... narration is very good. Only true artist can show his work in all platforms.